Francis Coppola's return to cinema was perhaps the most disappointing film of the year 2007. Coppola produced his little art film under the noses of all press, bloggers and cine-spies. And so when it was announced last year he had a film completed, in the can, and that it would be released late in the year, near the other Oscar pictures, the buzz was palpable. It had been 10 years since we'd seen a new Coppola film (since 1997's "The Rainmaker"). We all knew Coppola's best days were behind him, and his film output in the 90's were less than stellar, but there's always a glimmer of hope that some of the old magic that produced a string of film masterpieces in the 70's would be re-sparked. The story behind the making of the film teased us even more - a self-financed venture, shot in Bulgaria, with a small hands-on crew, the same manner of production Coppola's early films were made. Unfortunately it's a mess of a unrealized ideas and only a tease of the once great filmmaker. 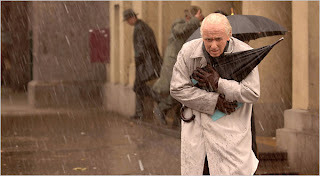 The film tells the long epic story of a Romanian professor Dominic (Tim Roth) who in 1938 at age 70 is struck by lightning and finds himself near death in a hospital bed. After several days hidden under a cloth bandage he emerges 30 years younger. His doctors cannot explain the phenomenon, but somehow Dominic has tapped into a metaphysical fountain of youth which bewilders everybody. He not only has the ability to stay young, but he discovers other magical powers of mind control as well. The story gets circulated around the world, and attracts some unsavoury parties - including the Nazis and American Intelligence agents. Dominic uses his powers to evade his crafty pursurers and go into hiding. Years later in 1955, the film picks up Dominic living a solemn lonely life in the country. One day he bumps into a doppleganger version of his lost love Laura - except this woman is named Veronica (Alexandra Maria Lara). Veronica has also been struck by lightning and like Dominic exudes weird metaphysical abilities. Veronica can now speak Sankrit and communicate with the dead thousands of years old. Dominic finds himself with the opportunity to finish his life's work in language-study and fall in love with his old flame again. "Youth Without Youth" is one of those metaphysical experimental films, which suits the art-house sensabilities of a David Lynch or Peter Greenaway more than Mr. Coppola. To his credit Coppola manages to craft a stunningly beautiful film, but he sets such a slow and languid pace, it becomes an utterly tiring exercise to watch all 124 mins in one sitting. The first half is the most intriguing as Dominic learns of his new found abilities, including a dramatic confrontation with the Nazi Gestapo agent. Hell, Matt Damon even shows up, playing someone similar to his CIA character in "The Good Shepherd". The second half leaps from a suspenseful noir, into a period romance genre and peeters out to become virtually nothing. The ideas get so big the film eventually becomes an unruly uncontainable mess of metaphors, pseudo-science, and anthropological mumbo-jumbo. Though Coppola took the 'keep it simple stupid' approach to the production, he chose to film a film too complex for his return. Though it currently sits 28% rotten on the Rotten Tomatoes meter, it's not the anamimous critical trouncing you'd expect. The film is not all that bad either. The film possesses a poetic beauty complimentary to its ruminations on the meaning of life. Unfortunately while some may find it's existentialism profound, most others will shut the film off once Tim Roth starts speaking his voiceover in the artificial language invented by his character - seriously, that happens. "Youth Without Youth" is available on DVD May 13 from Sony Pictures Home Entertainment. Years ago we were told to come in out of the rain and especially more so if it was thundering and lightening. It makes you wonder is it worth staying out to get back your youth, however is there any truth in that saying that lightening never strikes twice in the same place.